What you've been pointing your camera phones at this week in the world of advertising. Yeah, sometimes our lives feel like a strangely-filled Pot Noodle as well. This appetizing image is from Tracey Follows of JWT, the brand-new chair of the APG. We're not sure what she's getting at, but we sense frustration. And perhaps hunger. 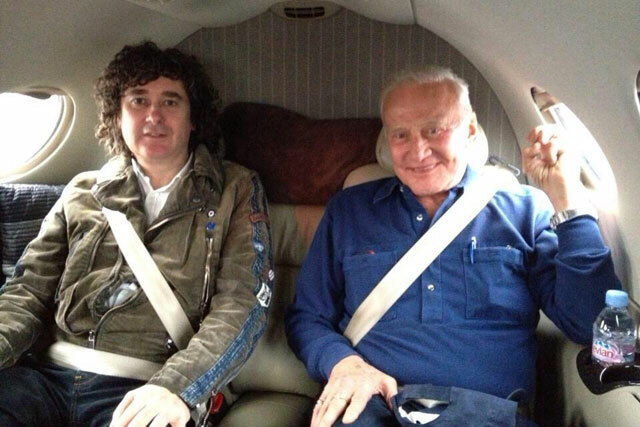 BMB founder Trevor Beattie tweeted a picture of himself with Buzz Aldrin, taken last year, to celebrate the astronaut’s birthday. Beattie is a space fanatic and thinks he may get there this year with Virgin Galactic. We could all do with a little less bombast. Alex Balfour, chief digital officer of The Engine Group, admires the giant bird on Trafalgar Square’s plinth. If you think it's chilly over here, check out NABS's tweet of ITV's commercial director Simon Daglish, who reached the South Pole at the end of December as part of the Walking with the Wounded expedition. The adventurers were welcomed back at a press conference this week. Andrew Stephens, partner at Goodstuff, was struggling with a dilemma: can he pinch this lovely wooden block from Pret A Manger that just so happens to have Good Stuff written on it? Now that he’s tweeted about his intentions, we think he’d best not – they’d know who the culprit was.